The day of reckoning has come. There be gold in the eShop for you to dig up today and that gold goes by the name of SteamWorld Dig 2! Last year, before it first appeared in the Nintendo Switch eShop on September 21, as press, I got to experience SteamWorld Dig 2 in its entirety, before the general public and the game literally blew me away. It was everything I had hoped it would be and quite frankly, I found it to be so good, I couldn’t help but give it a 10/10 in my very extensive review, but now the game is on 3DS and there are two questions that needs to be asked, “Is it still as every bit as good as the Switch version?” and “Is it worth owning on the 3DS, even if I have it on another platform?” Well, that’s exactly what we’ll be answering in this review! 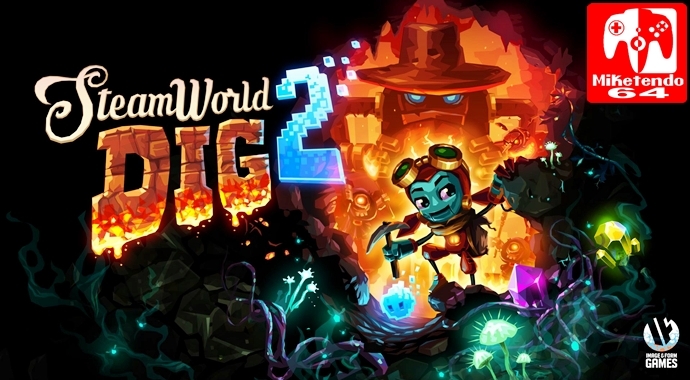 In terms of what is new and what is different, in comparison to the Switch version, Dig 2 might not have the exact same graphical display on the older, handheld only platform, as 3DS can’t visually compete against Switch, but the world of Dig 2 is still alive and vibrant, only whereas with Switch you can only experience it in 2D, the 3DS version, will allow you to play the game in 3D as well. Sure, you can’t dock it and watch the events of Dig 2 play out on a much bigger screen, but it’s still portable and can be taken on your travels. Not to just leave it there though, the 3DS version also takes advantage on the platform’s second screen, by using it to display the materials you have collected when out on your travels and right next to your treasures, is the game’s map (once you get access to it.) Now, although I liked the screen display on the Switch version with things like the map being shown in the top right, along with your cash and cogs, with things like your pick-axe and its associated button, being shown in the bottom left, with the 3DS moving all of those to the bottom screen, it frees up the top screen to be all about the gameplay. So, while everything is shown on a smaller screen than Switch, the top screen has been freed up and it makes it look better because it’s free of distractions, but you need the information that has now been moved, all you need to do is cast your gaze downwards and it’s all there for you on the bottom screen. So, SteamWorld Dig 2, it’s finally here, this time on Nintendo 3DS and it is still everything Dig could and should have been, in a single package. In a lot of ways, it is still very much so the original title, in the sense of it being well written tale about robots operated by steam, living in a desert, with digging and mining resources playing a huge role, only Dig 2 is all of that on a far larger scale! Dig only scratched the surface of Metroidvania, whereas Dig 2 digs a lot deeper and is a true showing of what a SteamWorld Metroidvania could be, thanks to the much larger world its developers were able to create for it, and the fact that exploration and platforming now play more of a tremendous role in it. I mean, yeah there’s a story and a pretty good one at that, which you can blitz through in about 5-7 hours if you solely focus on it, but with there being so much more going on in Dig 2, the story can easily be tossed aside, to make way for your obsession with exploring every nook and cranny, in the hopes of discovering every secret in your efforts to attain 100% completion! One such secret, is a nifty Rusty amiibo figurine that is simply gorgeous, whereas other secrets/collectibles are cogs and artefacts that are most certainly worth collecting as artefacts can help you earn blueprints in El Machino from an NPC, which can be used as part of the game’s upgrade system. Something else that can be used as part of the upgrade’s system, are the resources you mine, as they can be sold for cold hard gold coins that you can then use to buy upgrades like more health, more water tanks for storing water since things like the Jackhammer (an awesome power-up that can speed up digging,) consume water and more. But, just in case upgrading cool items and power-ups aren’t enough for you, there are even customisable load-outs available that require the gold cogs. So, if you like using the pickaxe and want to gain more experience every time you kill any enemy, there’s a customisation for it, If you want your lamp to burn a little brighter and further, there’s an optional upgrade for that too and so many more, but because there is a limited number of cogs in the game, and more unlocked as you progress and level up by gaining experience, this is where things can get really interesting. SteamWorld Dig 2 doesn’t just dangle customisations in front of your face, it actually forces you to change up your gear and abilities from time to time, as it encourages you to adapt and shape the SteamWorld experience to your own liking, so that it becomes your own adventure and even if you can’t find those dastardly cogs as some are so well hidden it’s untrue, there is a trader in El Machino you can buy some from, only they do get more costly for every one you purchase. But as good as the customisation element of Dig 2 is, even on 3DS, the game’s best aspect is its graphics. Toned down or not, it is still a game home to locations that are so beautiful, so frightening and so surreal that it is near impossible not to be appreciative of them. They are great, they are a sight to behold and they help give the game more life than the 7-15 hours that are required to properly complete it, as Dig 2’s visuals are so alluring, they can easily have you coming back, eager and willing to do a second and a third playthough and thanks to their hand-designed with procedural generated elements nature, the world of Dig 2 will also stay fresh! Still, if you’re sat there thinking this game looks like it is mere is child’s play, it’s not. There are boss battles, there are enemies and all of them will stop at nothing to kill you, so when playing through, but you also have to put up with that and Fen’s penchant to get you to blow things up, including you. (What is a Steambot to do?) So, in terms of dying, even if you were the most skilled gamer in the world, you will die at some point when playing Dig 2 and since dying means you run the risk of losing the resources you’ve mined, it is in your best interests to free up the various Teleport Tubes that are discoverable all over the map, as in a pinch they are a good way of making it back to the surface in a single piece, with your haul intact. If you do die though, or are forced to leave ore and the like, behind because you have a full load and don’t want to discard anything, not to worry, it will stay where you left it so you could always collect it the next time you’re passing that way. But the funny thing is, that’s Dig 2 in a nutshell. Just when you think you’ve seen/collected all there is in a single area, it doesn’t compare to what comes next just by venturing that little bit more. More awaits and awaits around the corner and once you’ve seen that, again more awaits. Granted this cycle does end, as there is a limit in place (there’s only so much a medium sized team with a limited budget can do,) but until such a moment is reached, a rush and adventure, is to be had the entire time. The truth is, if you are looking for a Metroid: Samus Returns alternative on Switch, SteamWorld Dig 2 is a pretty darn good choice and even though it is a sequel, there really hasn’t been a SteamWorld game quite like it. It is as original as the game that came before it, but so much better! The music is superb, the worlds are fantastic and it really is the game I will be obsessing over inbetween the other games I’ll be playing as part of my review duties. It really is sublime and everyone who worked on it pulled their weight and delivered an absolute knockout because that is exactly what Dig 2 is. It is a true indie knockout on any platform it is on. I still feel it is a shame Rusty is not the protagonist this time around, as he’s been kicked to the curve in favour of Dorothy (aka Dot,) Rusty is still crucial to the plot since it is his disappearance that prompts Dot to head to El Machino in the first place, but Dot and her companion Fen, are great protagonists in their own right and it was nice of Image and Form to show her off in a new light that adds to the character we were first introduced to in Dig, and that alone should be reason enough for you to play Dig 2, if you haven’t yet but are a fan on its prequel! And now let’s move on to the conclusion! The presentation may have been changed somewhat, thanks to the inclusion of a second screen that really does come in handy, but my word, Image & Form have truly topped themselves. I had thought it was impressive that they could even make a game like Dig 2 in the first place, as it is a true work of art, but Dig 2 on 3DS is even more incredible. The action is 60fps, even when playing with the 3D on and that second is just a blessing as now it is even easier to see where you’re going, and the graphics are still beautiful, even if they are presented on a smaller screen. So, without a single doubt in my mind, SteamWorld Dig 2 on Nintendo 3DS is simply sublime as it is a fantastic game that was made compatible with all versions of the Nintendo 3DS and takes full advantage of them, which only makes it a fantastic game made even better so if you don’t get it for your 3DS, then you are missing out on something truly wonderful!